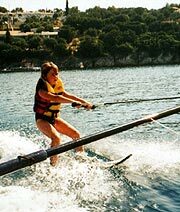 Sakis Water Sports successfully started teaching water-skiing in 1986. Since then, each summer it has continued to welcome regular visitors and newcomers of all ages and abilities, to Kalami, to enjoy the relaxed atmosphere of recreational water-skiing. Because of local restrictions there is no slalom course or a jump ramp. The emphasis is very much on introducing the sport, in a safe and professional manner, to many who might not usually have the opportunity. Now over 300 beginners pass through our hands each year. 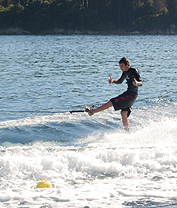 Although beginners are very much our speciality, a great many skiers return to Kalami each year and have successfully progressed to tricks, mono, wake-boarding, wake-skating and knee-boarding. As well as skiing we also offer Ringo and Hot Rod Rides. These are great fun for all ages and each ride tailor made to suit individual abilities. Check out our photo gallery for a view of the bay and the water we use. 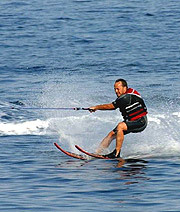 A wide range of water skis are available and include combos, monos, wake-board, wake-skate and tricks (combo and mono). For the smaller members of your party we also have a skimmer board. We use only top quality equipment, mostly H.O. and Connelly. 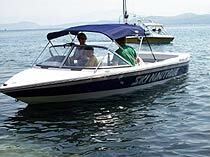 Our main towing boat is a 2007 Ski Nautique 196 with a 330hp PCM Excalibur inboard engine. 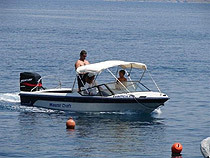 Our second tow boat is a Mastercraft Pro Star 200 fitted with a 175hp Mercury Optimax outboard engine. 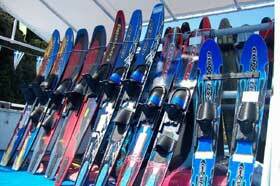 Beginners are our specialty and we offer a fully comprehensive lesson consisting of a dry land lesson, the wearing of the skis, a lesson on the training boom and a lesson on the rope if progress is satisfactory. 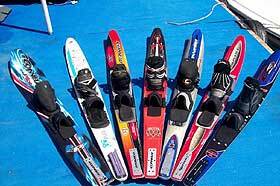 Professional tuition is given to all levels by fully qualified, British Water Ski Federation Instructors. A skylon tow pole is available for wakeboarders. All ages are welcome and we have experience in teaching from 4yrs to 70+yrs.  All we ask is that you kindly inform us of any health or physical condition that may impede progress. Whenever possible special needs will be catered for. Ringo and Hot Rod rides are great fun for all the family. Each ride is tailor made to your request..fast, medium or slow. What ever you wish to try don’t be shy!! 1. A suitable bathing suit or shorts. Neoprene shorts and wet suits are available for use on the pontoon. 6. Motivation and a sense of humour! 4. A lesson on the training boom on the water and if progression is satisfactory, a lesson on the short line on the boom or behind the boat. Moving from side to side (slalom) and crossing the boat wake. Progressing to mono is always an exciting time. When a skier can ski along, comfortably lifting one ski for a period of time, they are ready to try mono. The usual progression is to drop a ski, wearing one loosely and discarding it while going along. The skier would then slowly put their foot into the back binding. The next step is to learn a deep-water start. This can be done with either both feet in the bindings or one foot in and one foot trailing. Which ever start position is preferred it can first be practised on the training boom. Cradle ropes are also available to aid easier starts. Trick skiing is a wonderful discipline to learn and definitely impressive to watch. Again it is an advanced stage that can be progressed to after becoming competent on combo skis. First learning on a pair of trick skis, you will soon learn the basic tricks of a ‘side slide’, ‘180’ (going backwards) and a ‘360’ (turning a complete circle whilst going along). 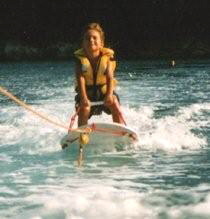 The next stage will be to learn to do these and many more tricks on a mono trick ski. 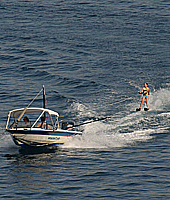 Wake boarding has become one of the most popular disciplines, amongst the young, on the water. A deep-water start and a few basic tricks can be achieved fairly quickly and the skylon tow pole allows you to get that ‘air’ for the bigger jumps! This sport ranks high in the ‘cool’ league! 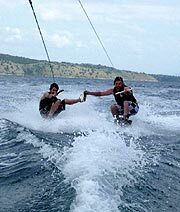 Knee boarding has perhaps been slightly overshadowed by wake boarding over the last few years but still offers great fun to many and is easily learned. 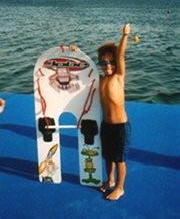 Before long most boarders are impressing friends and family with side slides, 180’s, 360’s and wake jumps. Easily achieved, exhilarating fun! We always do our best to ensure that no one, who doesn’t want to be, is left out. For the very young and eager members of your party we have a skimmer board. 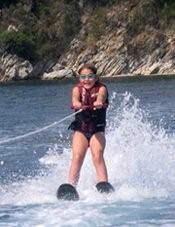 It is the first stage in water-skiing and easily achieved by most. 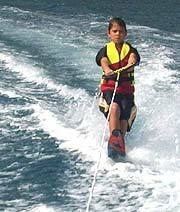 It has the advantage of giving small children the experience of moving along on the water and the confidence to later try combo skis. A great way to start! For the members of your party who don’t want to ski or those of you who want to chill out with a bit of fun we have Hot Rod and Ringo Rides. They are great fun for all the family and each ride tailor made to your request.